Fathom Events and GKIDS are partnering to bring Hayao Miyazaki's My Neighbor Totoro to select cinemas nationwide for a special two-day event on June 25 & 26 as part of Studio Ghibli Fest 2017. 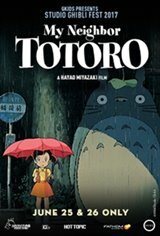 One of the most endearing films of all time, Hayao Miyazaki's My Neighbor Totoro is a tale of two girls who move to a new house in the countryside. They soon discover that the surrounding forests are home to a family of Totoros, gentle but powerful creatures who are seen only by children. Dubbed in English on June 25 and subtitled on June 26, this special two-day event will also include an exclusive edition of the GKIDS MINIFEST, an ongoing festival of short animated films from around the world!